This is Wayback Wednesday, your midweek blast from the past! In this feature, we dig into the archives, look back at the history of basketball gaming, and indulge in some nostalgia. Check in every Wednesday for retrospectives and other features on older versions of NBA Live, NBA 2K, and old school basketball video games in general. You’ll also find old NLSC editorials re-published with added commentary, and other flashback content. 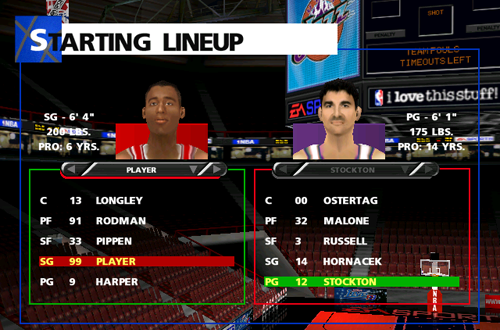 This week, I’m taking a look back at the 1998 rosters in NBA Live 99. The 1999 NBA season isn’t considered a classic year for the league, but it’s certainly interesting and significant in its own right. It was the first season in which games were cancelled due to a lockout, and indeed, the first time it appeared as though an entire season may be lost due to a labour dispute. It was also something of a transitional season following Michael Jordan’s second retirement, with the defending champion Chicago Bulls being broken up, a lot of key players around the league moving on to new teams, and early signs of a new era beginning in the NBA. For those who are unfamiliar with the consequences of an NBA lockout as it pertains to video games, until Draftees can sign their rookie contracts, they’re not under the NBAPA licensing agreement. A lockout obviously delays that from happening, and as such, they cannot appear in any NBA licensed products (like video games), until the labour dispute is resolved. As I’ve previously discussed, the Super Nintendo version of NBA Live 96 found a way around that with Create-a-Player presets. Players who were active during the previous NBA season can be included of course, so games developed during a lockout don’t have to ship with entire rosters of generic players. Because of these restrictions with the NBA license and the subsequent ramifications of the lockout of 1998-99, NBA Live 99’s default rosters didn’t feature Vince Carter, Paul Pierce, Antawn Jamison, Mike Bibby, Dirk Nowitzki, and the rest of the Class of 1998 rookies. Because the lockout also prevented any other player movement, effectively postponing the beginning of the 1998 offseason until a new agreement was reached, the game also shipped with final 1998 season rosters. However, some players were already playing for new teams, and there was actually a single rookie to be found in the default rosters. How was this possible? Well, in terms of contracts and transactions, an NBA season actually runs through the end of June, including the Draft. Although the Draft is commonly considered to be a part of the offseason, as it follows the conclusion of the NBA Finals, it technically takes place during the previous season (though Draftees cannot sign their contracts until the offseason begins). This means that any transactions that were made by non-Playoff teams during the 1998 postseason, as well as trades made during the 1998 Draft, technically happened during the 1998 season. Therefore, they could be included in NBA Live 99. That’s exactly what happened. NBA Live 99’s final 1998 season rosters include postseason and Draft day transactions, such as the Sacramento Kings’ trade of Mitch Richmond to the Washington Wizards for Chris Webber (completed May 14th 1998, during the Playoffs), as well as the deals during the 1998 Draft that sent Nick Van Exel to the Denver Nuggets, Steve Nash to the Dallas Mavericks, and Antonio Daniels to the San Antonio Spurs. Chris Webber is notably wearing number eighty-eight for the Kings, as Corliss Williamson did not officially give up his number four until after the lockout. It also marked the final time that Michael Jordan was represented by a Roster Player in NBA Live, now wearing number ninety-nine for the Bulls. As for the lone rookie in NBA Live 99, that would be Peja Stojakovic of the Sacramento Kings. Peja was actually drafted in 1996 and finally decided to make the jump to the NBA in 1998, signing his contract before the lockout went into effect. With Chris Webber using number eighty-eight as a placeholder, Peja was assigned number eighty-nine. Players who had actually been rookies during the 1998 season, such as Tim Duncan, had their Years Pro updated to reflect their one season in the league. Fortunately for PC gamers, EA Sports were eventually able to provide a solution. The lockout ended, the 1999 season was salvaged, and an abbreviated offseason brought a flurry of trades and signings. EA’s first patch for NBA Live 99 therefore not only included technical and gameplay fixes, but also the first official roster update in the series, including rookie faces and speech files. A second patch updated the rosters through the trade deadline, notably removing original players like B.J. Armstrong, who began the season with the Hornets and finished it with the Magic, but had been cut by the Lakers following his inclusion in the Glen Rice trade at the deadline. The official roster updates for NBA Live 99 ended up overwriting the original roster files, thus becoming the new defaults. Since most gamers would have installed the official patches, both originally and upon reinstalling NBA Live 99 later on, it’s probably fair to say that the original 1998 rosters tend to be forgotten, and rarely played with. Incidentally, if you do want to play NBA Live 99 with those rosters after installing the patches, you’ll have to copy the original files from the CD-ROM. Alternatively, you can download them here, if you’d like to save yourself the trouble of creating and overwriting a roster save. With the inclusion of final 1998 season rosters, NBA Live 99 became an unintentional throwback to the early days of the NBA Live series. 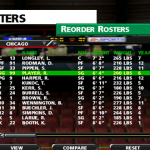 In addition to the 1995 lockout affecting the rosters of NBA Live 96 on SNES, the original console releases of NBA Live 95 featured final 1994 season rosters, in contrast to the updated 1995 season rosters in the PC version. 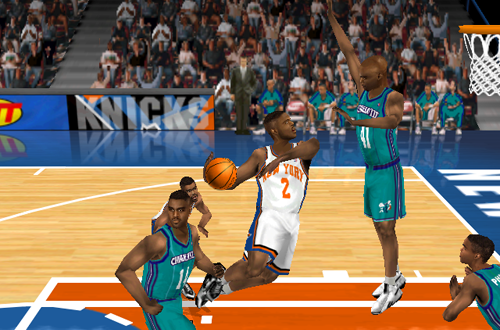 However, unlike NBA Live 99, they didn’t account for transactions that took place during the postseason or Draft, such as the releases of Moses Malone and Pervis Ellison in 1994, or the 1995 trade between the Hornets and SuperSonics that sent Hersey Hawkins to Seattle and Kendall Gill to Charlotte. 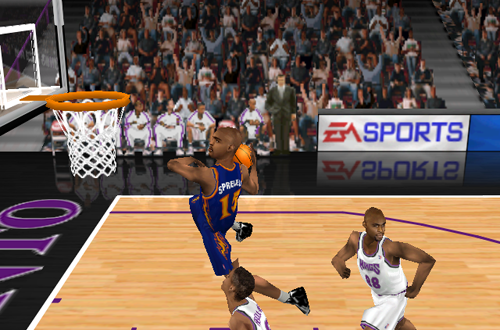 NBA Live 99 wouldn’t be the last game to be affected by a lockout. With the lockout of 2011-12 ultimately shortening the 2012 season by sixteen games, 2K Sports wasn’t able to ship NBA 2K12 with Class of 2011 rookies and updated rosters. Of course, official roster updates for sports games were commonplace on most platforms by that point, so it was no surprise that new rosters came through not long after the fourth lockout in NBA history ended in December 2011. Back in 1999, only the PC version of NBA Live 99 was able to benefit from an official update, whereas the console versions and other NBA games that were console-only remained stuck in 1998. As I noted in my retrospective, NBA Live 99 is somewhat of an overlooked game. Sandwiched between NBA Live 98 (a milestone improvement) and NBA Live 2000 (commonly considered one of the best games in the series), and featuring one of the least popular cover players in Antoine Walker, the gloom of the lockout only adds to the long shadow that’s often cast over NBA Live 99. It’s unfortunate though, because it was a fine game in its day, deserving better than coming along at a time when the league was in somewhat of a crisis. All the same, as its original 1998 rosters demonstrate, it has some interesting features to look back on, all these years later. It is true that they released nbablive 99v2 for the ps1? It was to correct the fatigue issue. Did they? That’s the first I’ve heard of a V2 on any platform, aside from the patched PC version. I believe there was an “EA Classics” version on PC that included the patches, so I suppose it would make sense that there’d be some updated pressings of the console versions as well. Of course, that doesn’t help people who bought the game during the initial run. As much flak as Day 1 patches get these days, at least those fixes can be pushed through easily, along with roster updates and the like. We don’t have one in the Downloads section at this time, though it would be fairly easy to make. In NBA 2k12 I lost the last official roster update. I got one but the arms of the rookie are black. Even a white rookie got black arms. Why its this? Why 2k don’t have the last roster update so everyone can download by USB? It would definitely be handy. Unfortunately, it’s up to the community to do that. Since I like to do roster updates I got index card for every player from live 96 to live 2001 of ps1. Many of the players are from 96. To 97 to 01 like 100 to 200 new players. But the majority are from live 96! There’s generally a lot of turnover in the players over a 5-6 year span in the NBA, but at the same time, a lot of familiar faces as well, so that’s not surprising.